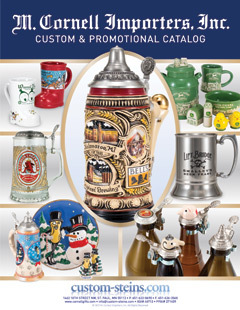 80 page full color catalog featuring over 600 different Steins and Accessories. All stocked in St. Paul, MN. We are the exclusive import agent for Domex/Gerz, Germany. All items can be specially ordered or customized. Please allow 60-90 days lead time, and send all orders/inquiries to M. Cornell Importers, Inc.